July 23, 2010 - Three foreign pilots with the "Gladiators" of Strike Fighter Squadron (VFA) 106 landed aboard the aircraft carrier USS Enterprise (CVN 65) July 15 as part of a pilot exchange program during the ship's fleet replacement squadron carrier qualifications. The Navy has long been a forward-deployed presence throughout the world, providing unique opportunities to work closely with, and learn from, military personnel from other countries. The opportunity for these pilots to embark and train aboard Enterprise provides them with the chance to gain valuable experience and insight into carrier operations. "I'm here in the U.S. as part of a pilot exchange program between the Swiss Air Force and the U.S. Navy," said Capt. Ralph Iseli, a native of Beringen, Kt. Schaffhausen, Switzerland. "When I heard I was coming here, I was really excited. It's an amazing opportunity to come to a carrier the Swiss Navy does not have them. I get to watch the ship perform carrier qualifications and tactics, something I would never have the opportunity to see in the Swiss Air Force." Iseli explained that there is always an exchange of pilots taking place between countries, ensuring the U.S. and its allies are trained in as many different skills as possible. In Switzerland, Iseli said that some of his duties included training new pilots as well. "There are three squadrons in Switzerland, and because of that it means all the pilots must train the newer ones to become fully qualified," said Iseli. "I think the more experience I gain here, the better I can train those young pilots." Iseli is gaining valuable experience to take back to Switzerland and pass on. Trapping [aircraft] on an aircraft carrier never gets old. It's truly a once-in-a-lifetime experience to train on an aircraft carrier". Also training with the "Gladiators" are Lt. Ben Hullah and Lt. Stephan Collins of Great Britain. The "Gladiators" welcome the rare occasion to work with pilots from other militaries. "I'm thrilled we get to work with pilots from foreign nations because it gives us insight as to how other countries train,," said Lieutenant Matthew B. Rhodes. "This opportunity allows us a chance to work with pilots with a completely different skill set." The pilot exchange program is just one tactic in the Department of Defense's overall strategy to maximize interoperability in a global war fighting environment. Today, more than ever, the United States and its allies train and fight together in a multinational environment. The pilot exchange program is a critical part of ensuring that everyone can communicate effectively and execute the mission, no matter where the battlefield is or where the war fighters come from. 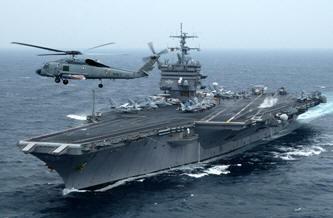 Enterprise is at sea preparing for work-ups leading to its 21st deployment.